MSRP $196,473. 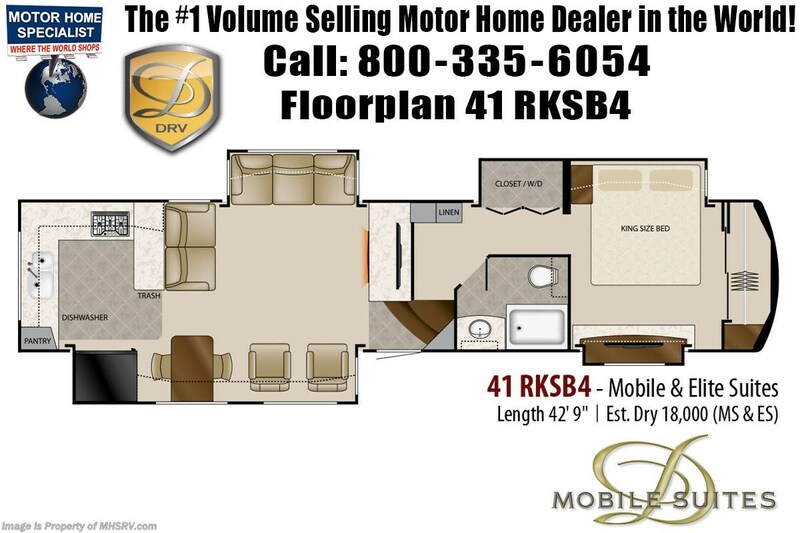 2020 DRV Luxury Mobile Suite 41RKSB4. 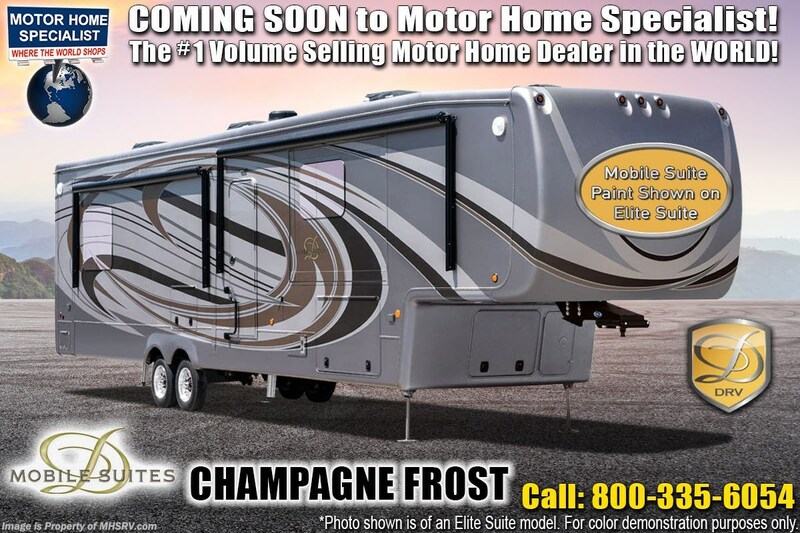 Now Available at Motor Home Specialist, the #1 volume selling dealership in the world. At MHSRV you'll find a huge selection of luxury RVs including $2MM Prevost™ Bus Conversions and of course the DRV which stands second to none in the towable world. At MHS every DRV unit is special ordered making them the absolute best-of-the-best available in the market today. Special ordered items on this particular Mobile Suite includes a multi-plex lighting system, a fiberglass roof, Portabello flooring throughout (no carpet in bedroom), DRV's premier "Champagne Frost" Elite Suite full body paint scheme upgrade with matching painted slide-out room caps and window silks, 3rd A/C and the all important Truma® tank-less hot water heating system that provides a virtual endless supply of hot water. . Additional options include the unmistakable Hazel wood package, Franklin Series residential furniture, 3-burner cook top and oven, HD automatic satellite dish, HD exterior TV and entertainment center, Wi-Fi Ranger wireless router, built-in safe, extra matching dinette chairs, dual heat pumps, MaxxAir® fan with rain sensor, 2 piece washer / dryer set, generator prep, 2800W inverter with four battery upgrade, surge protector, heat pads on all tanks and elbow heater on drain pipe, a power cord reel, Mor-Ryde© Step-Above step, Slide-out room toppers where applicable, power patio awning, slide-out storage tray and back-up camera system with wireless audio. You will also find the Mobile Suite's "Full Timer's Package" that includes a 55 inch HD Smart TV with built in sound bar, HD TV in bedroom, upgraded bedroom A/C, 17.5 Goodyear H-Rated spare tire and carrier, boat hitch with 7-way plug, quad-step entry, fixed ladder and frameless thermo-pane glass. In addition this unit also features the Traveler's Package complete with MCD day/night roller shades, a built-in fireplace, (2) MaxxAir® fans with rain sensors, power management system, six-point hydraulic leveling system (One-Touch auto leveling), Mor-Ryde© I.S. suspension upgrade and pin box and a keyless entry door. Other standout features found in this Mobile Suite includes a 20cuft residential refrigerator, a dishwasher, convection/microwave, a water manifold, LED lighting, all weather package and DRV's premier construction including their 15 inch Triple-Stacked Box Channel Chassis! For even more details on this unit and our entire inventory including brochures, window sticker, videos, photos, reviews & testimonials as well as additional information about Motor Home Specialist and our manufacturers please visit us at or call 800-335-6054. At Motor Home Specialist, we DO NOT charge any prep or orientation fees like you will find at other dealerships. All sale prices include a 200-point inspection as well as an full interior & exterior wash and detail service. You will also receive a thorough RV orientation with an MHSRV technician, an RV Starter's kit, a night stay in our delivery park featuring landscaped and covered pads with full hook-ups and much more! Read Thousands upon Thousands of 5-Star Reviews at and See What Fellow RVers From Around the World had to Say About Their Experience at Motor Home Specialist. WHY PAY MORE? WHY SETTLE FOR LESS?